Currently a ton of cocoa costs about $1,845 (€1,500) at the exchange, $25,610 (€20,821) at big chocolate producers like Barry Callebaut and $32,082 (€26,083) in the shop. 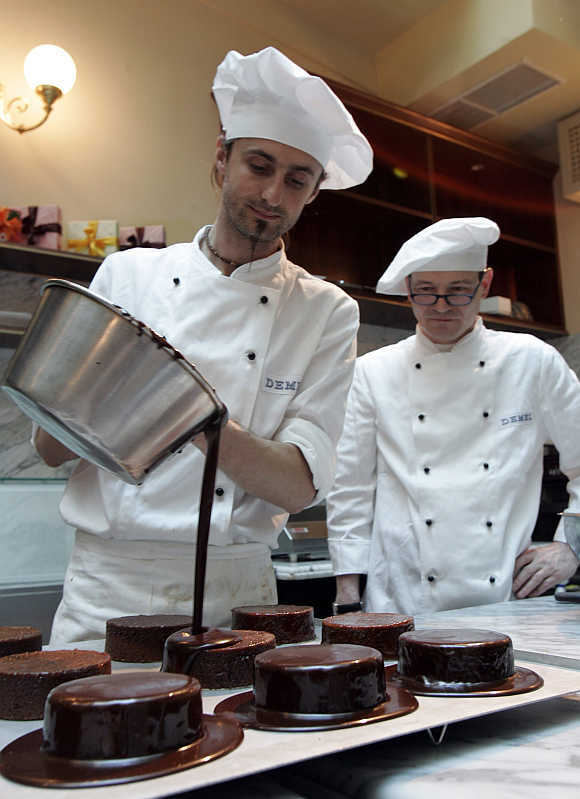 Yvonne Reh, chef patissière of the Columbia Hotel Casino Travemuende, a resort on Germany’s Baltic coast, carefully pours liquid chocolate into 50 sphere molds, turning them constantly so enough space remains later for the filling. 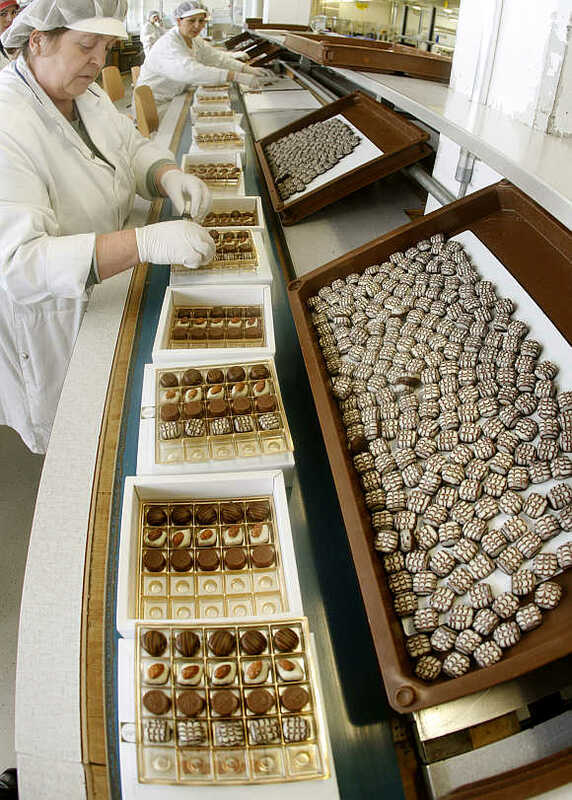 Transforming chocolate pellets into hand-made truffles takes 24 hours, which is reflected in the price of the finished product. 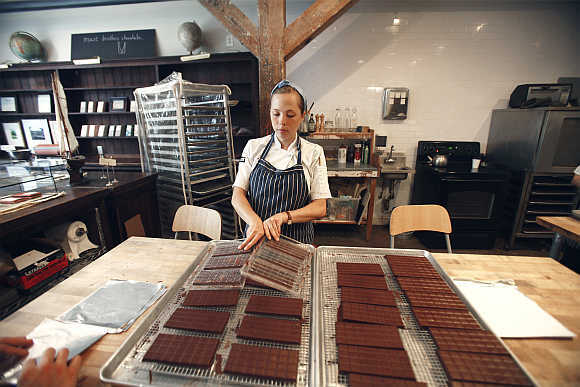 The young, blonde artisan buys her raw material from Swiss exchange-traded Barry Callebaut, the world’s leading producer of chocolate and cocoa products. 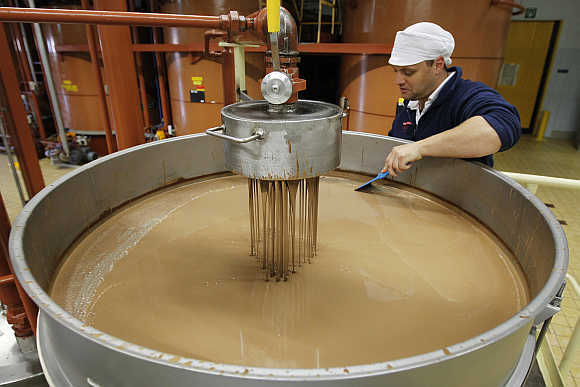 One third of the world’s cocoa production passes through the hands of the Swiss conglomerate, which has a turnover of €4 billion ($5.5 billion). 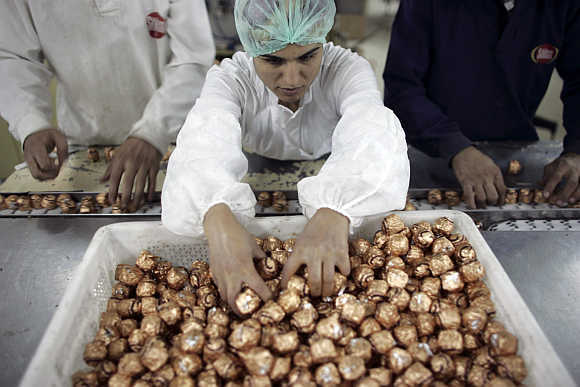 Mass market producers, such as Nestlé and Kraft, are clients of Barry Callebaut, as is high-end Belgian chocolate producer Godiva. 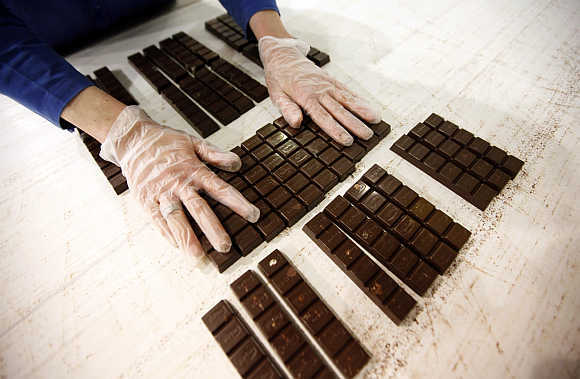 What ends up in the paper laces and gilded boxes of western consumers originates in South America, Asia and Africa, where the chocolate story is far from saccharine sweet. Up to 50 million people make their living from cocoa plantations according to the World Cocoa Foundation. Ivory Coast grows 40 per dent of the world’s cocoa to satisfy a demand that has increased 3 per cent per annum on average for the last hundred years, says the foundation. Many small-hold farmers in the country don’t send their children to school but into the fields, loaded down with canisters of chemicals to protect the fragile theobroma cacao. For their efforts and their children’s sores, farmers typically receive 33-50 per cent of the official price, says Frank Bremer of the Deutsche Gesellschaft fuer Internationale Zusammenarbeit, an organisation commissioned by the German government to organize development aid projects. Fair Trade cocoa guarantees a better price for farmers, with a minimum of $2,000 per ton. In addition the organisation puts a premium of $200 on top to finance social projects. Although this initiative has grown in recent years, most consumers still vote with their wallets, so it is unsurprising that Fair Trade cocoa still accounts for less than 1 per cent of the market according to The Market for Organic and Fair-Trade Cocoa (United Nations Food And Agriculture Organization, 2009). Underpaid farmers, difficult market access, smuggling, rampant corruption and civil strife makes a mind-boggling mix obscuring market forces. Various experts from NGOs working in the country suspect that 60 per cent of Ivory Coast’s cocoa export revenue used to disappear in the state coffers, or in private ones. Former minister of agriculture Alphonse Douati was put on trial in 2008 for allegedly skimming off €150 million. The price for cocoa is fixed by the London International Financial Futures and Options Exchange (LIFFE), which handles 75 per cent of all cocoa contracts in the world. These include options that allow producers and consumers to hedge against sudden price moves. One move occurred in the summer of 2010. After years of falling production and rising demand, the price skyrocketed to a 33-year-high. Rumors spread that someone had cornered the market. The usual suspect in the small world of cocoa traders is Anthony Ward of the London-based hedge fund Armajaro. Ward, the cocoa specialist of the finance house, is dubbed 'Chocfinger' by fellow traders. Competitors believed Armajaro held 500,000 tons of cocoa in hand in the form of future contracts, which can be bought and sold against a deposit of as little as 2 per cent of its value. Whoever had bet on falling prices found no more physical cocoa on the market and watched losses mount until his broker’s margin call relieved him of his misery, and plenty of money. Squeezed out shorts had to cover their positions, at great expense. The funds went – if market rumors are to be believed – straight into Armajaro’s pockets. Yet on July 15, 2010, rumormongers almost fell off their chairs. Contracts for 240,000 tons cocoa (equal to 7 per cent of global production) fell due. Many had believed they would be rolled over since market corners prove notoriously difficult to unravel. Armajaro, mentioned widely in mainstream media as the party involved, simply took delivery and left the competition speechless. 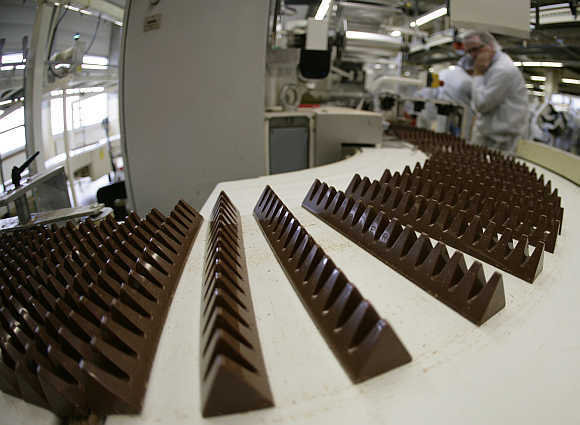 Market insiders believe that Barry Callebaut brought the lot, though neither company has confirmed or denied the deal. 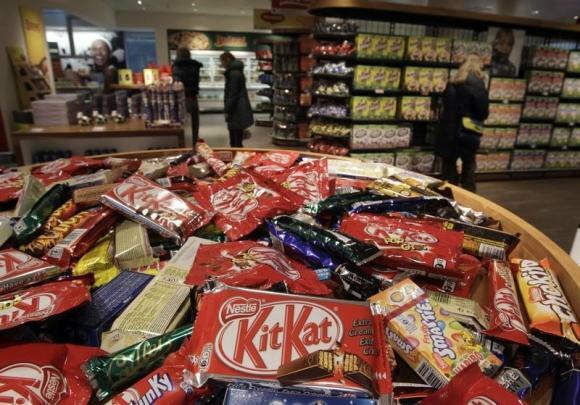 The market manipulator, whoever it was, made an additional killing with September contracts comprising 200,000 tons, about $107 (€77) per ton, according to the International Cocoa Organisation (ICCO). A complaint by the industry body to LIFFE amounted to nothing. For the exchange it was business as usual. Events became further complicated in November 2010 when Ivory Coast held its presidential election. Alassane Ouattara was the winner but outgoing president Laurent Gbagbo, who had grown rich on his nation’s cocoa export, was reluctant to leave his lucrative post. Months of civil war ensued and thousands were killed. Ouattara, supported by the international community, placed an export ban on cocoa, disrupting the money flow of his predecessor. As supplies to markets became scarce, cocoa prices hit an all-time high of $3,770 (€2,448) per ton. When it became clear that Ouattara would prevail in April 2011, prices dropped 22%. 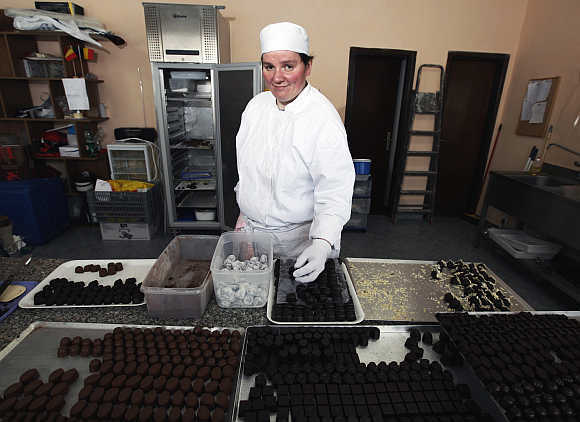 Back in the Columbia Hotel, Reh combines molten chocolate with more pellets to close the truffles. 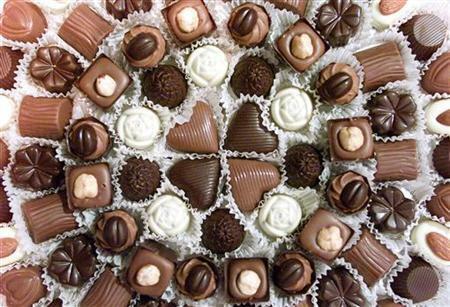 The truffles still lack their typical pimply structure that is the sign of the true hand-made item. “It’s all a question of the right temperature,” she says. By the time the chocolate pellets reach the hotel, the cocoa bean has been roasted, broken up, peeled, and milled. Whilst the bean may have lost one third of its volume by then, it has gained substantially in value. Currently a ton of cocoa costs about $1,845 (€1,500) at the exchange, $25,610 (€20,821) at big chocolate producers like Barry Callebaut and $32,082 (€26,083) in the shop, says the ICCO. The cocoa bean is said to be good for the skin, circulation, digestion and happiness. 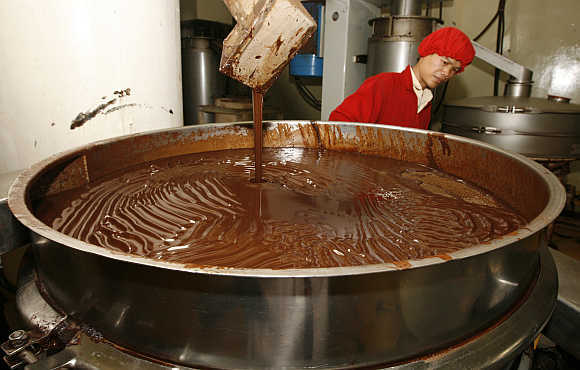 The magic of this crop was recognised as long ago as 1500 BC, when the Olmec tribe in Central America cultivated cocoa. The Maya later used the bean as money, paying as much as 200 beans for one turkey. The natural coin was promptly forged by Aztecs who painted vegetable beans brown. Reh, of course, works with the real thing. 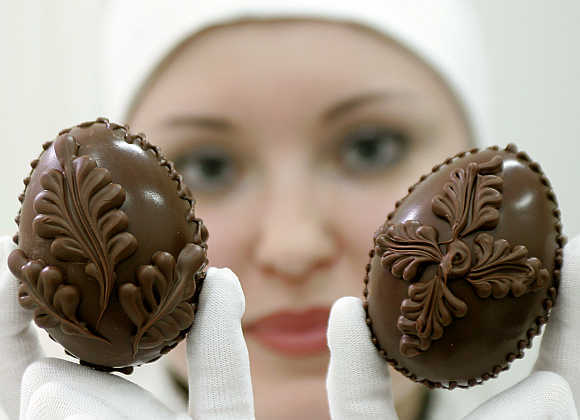 Her truffles receive a last hot chocolate bath and are rolled over with a wire mesh to gain their signature pimples. At long last, the truffles are ready to eat. Powered by To read more such stories Click Here! PHOTOS: Take a look at these fascinating toy factories!